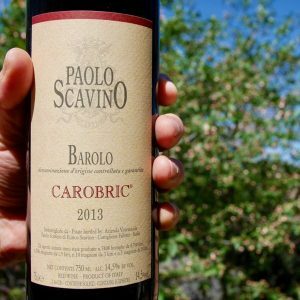 Finally I got to taste Paolo Scavino’s Cru Baroli, the results: sophisticated, harmonious, beautifully textured wines of individuality and with a great core of fruit. We quickly sold out of our 1st offer of these delicious Baroli. After much arm twisting we’ve secured a 2nd shipment. I recently tasted the 2013 Cannubi against Sandrone’s Aleste (aka Cannubi). Both were excellent. What shone through was the harmony, complex savoury personality and stunning mouthfeel of Scavino’s wines. I often find myself frustrated tasting through hundreds of wines a week. Too boring, to ripe, to technical, just no fun. Speeding through a trade tasting of wines from around the world, I was about ready to walk out when I spied a few wines that made me pause. Paolo Scarvino’s Baroli. The afternoon turned into an epic success. In front of may lay a cluster of real wines. Cru, single vineyard, Baroli this beautiful are less common than you think! These were wines that inspired, poured by Riccardo who clearly knew what he was talking about, lived it, breathed it. It seems passion runs through the veins of the entire business! “Through over 60 years of experience his focus has been to invest on important cru of Nebbiolo to show the uniqueness of each terroir. The most important words: respect, purity of expression, complexity, and elegance. Combine these with a winemaking approach that clearly demonstrates the wisdom that only time and experience can afford a winemaker, and, the results are individual wines of great personality and intrigue. These are the kind of wines that shift you from very good to great. With a clear transition underway to his daughters Enrica and Elisa it looks like Paolo Scavino will be in good hands for decades to come. Founded in 1921 in Castiglione Falletto, Paolo Scavino under the guidance of Enrico, and, now his daughters, Enrica and Elisa have amassed a superb collection of Cru vineyards in Barolo, representing 20 of 29 hectares with parcels across each of the communes. These are some of the best sites across Barolo. Click the map to link to an interactive page on Scavino’s website. *Quantities of the Cru’s are extremely limited. We’ll do our best to fill your request. The wines are available for immediate delivery. 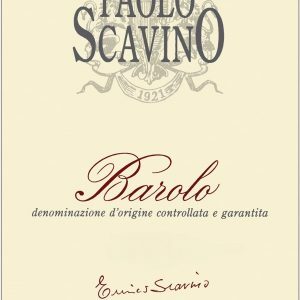 The Paolo Scavino 2013 Barolo sports the depth and elegance that famously characterizes the house style. Fruit is sourced from various points across the appellation and the specific blend changes according to the needs of the vintage. Amoung the various Barolo wines made by this estate, this wine is the most accessible and approachable for sure. The bouquet offers compelling aromas of black fruit and dried blackberry and there's plenty of spice, licorice, and tar at the back. The wine shows it's complexity as well as its varietal purity. You'll notice the handwritten signature of patron Enrico Scavino on the front label. Enrico Scavino’s experience, recognized the quality of this undiscovered beautiful cru and decided to purchase it in 2001. By luck this cru was the only one of the estate untouched by the hail in 2002 and debuted as a solo showing lots of personality and potential even in such a difficult year. Bricco Ambrogio has an intense and multifaceted aromatic spectrum. The core is soft and polished through a beautiful acid-tannic balance. There is an underlying depth in this Barolo and the finish is long and nuanced. This is a more structured and tannic expression of Nebbiolo that could use a few extra years of cellar aging to move it forward. The wine sports thick concentration and luscious fruit flavours that peel off in thick and succulent layers. Blackberry is followed by dried cherry, leather and spice. Only a handful (maybe five?) 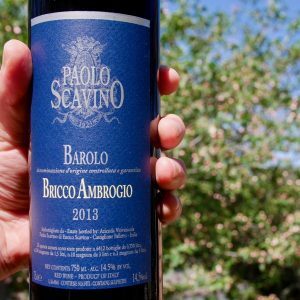 producers make Barolo from Bricco Ambrogio. This is a seriously gorgeous wine. This Barolo comes from the homonymous vineyard of Monvigliero that can be properly considered the “grand cru” of Verduno village. This cru was first vinified in 2000 vintage and blended intothe Barolo until the 2007 vintage when this vineyard has been bought by the Scavino family and made as a single cru. Great finesse and aromatic complexity, distinctly floral spicy, savory, balsamic in its expression. The nose is vivid and compound. The texture is focused. An extremely elegant cru, feminine and full of character. Such focused and precise fruit on the nose with a lovely ripeness of plums, flowers and light hazelnuts. Full-bodied, velvety and polished. Very pretty finish. Chewy now but will soften with time. Better in 2018. The Barolo D.O.C.G. CAROBRIC® was born in 1996 as a combination of three historical and complex terroir. The Barolo CAROBRIC® personality is about focus, precision of elements, intensity and length. The aromatics are lifted with a beautiful tension and clarity. As per all our Barolo, we pursue the purest expression of terroir. Therefore vinification and aging are all the same to underline specific expression of the vineyards. Very fresh and creamy on the nose. The palate is full of strawberries and fresh roses. Medium to full body and ultra-fine tannins that are integrated and polished. Lightly chewy on the finish. Give it three to four years to soften. Cannubi is probably the most historical vineyard of the all Barolo region, in Barolo village. We vinify this cru from 1985 and this is one of the two oldest vineyards of ours planted in 1946 on the central crest of Cannubi hill. Low yield ofthis vineyard is due to a special combination of natural factors one of which is the old age of the vines assuring a unique quality. Here it comes the concentration and richness of this Barolo where the charm of Nebbiolo is fully expressed. Harmonious and very fine texture. Aromas of strawberries, flowers and tea follow through to a full body, a dense center palate and a tannic and structured finish. Big and powerful Cannubi. Tiny production. Drink in 2022. Here the Nebbiolo grapes were always the best: consequently in 1978 Enrico convinced his father Paolo to vinify these grapes separately and show for the first time the potential of this site. One of the first grand cru to be made as single vineyard Barolo. 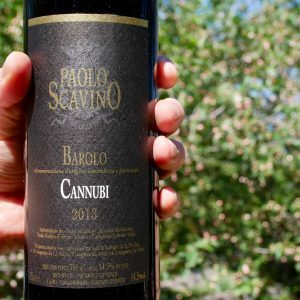 Image and identity of Paolo Scavino winery. In the Fiasco vineyard the Tortonian and Helvetian soils cross each other combining a great finesse and power. 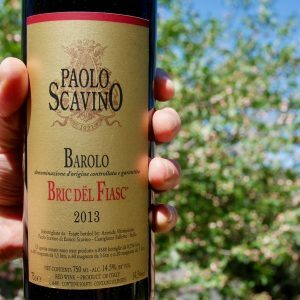 Classy and classic expression of Nebbiolo which requires time to develop all its complexity is Bric dël Fiasc®. The texture characterizes this Barolo: earthy imprint, density of fruit, vibrant and refined tannins. The acidity supports the important structure of this Barolo and lifts the nose which is complex, mineral, balsamic. Little red fruits and licorice are typical notes in Bric dël Fiasc. Polished and tight with blueberries, plums and light chocolate. Medium to full body, fine and juicy tannins and a fresh finish. Drink in 2018. From Castiglione Falletto (but close to La Morra). 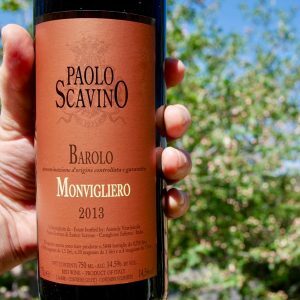 This is a darkly saturated and rich expression of Nebbiolo with bright aromas of dark cherry, dried blackberry, spice, leather and toasted hazelnut. THe wine stands out for the singular elegance it possesses, especially in terms of mouthfeel. The finish is still youthful and succulent, so think long-term cellar aging. Rocche dell’Annunziata is the Barolo Riserva of the Scavino family. An historical, prestigious “grand cru” from La Morra village purchased in 1990. Rocche dell’Annunziata is all about finesse, details, weightless elegance. It’s a symphony of ethereal aromas with harmonic motions. Rose petals, violet, lilac, tar, sweet red cherries, mint, minerals are some of the hallmarks of this beautiful cru. In the texture silk veils, layers that overlap with extraordinary grace yet offering intensity. Wow. Beautiful nose of fruit and dried flowers. Really original. Full body with lots of tannins that are defined and silky textured. Solid and tight at the finish. More time will make it even better. Try in 2019. 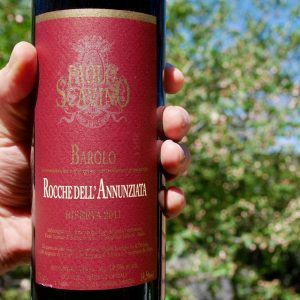 The 2011 Barolo Rocche dell'Annunziata Riserva (Current Riserva Release) is a profound and generous wine from a hot vintage. THe fruit is opulent and soft with blackberry, dried cherry and dark plum on prime display. The wine emits clear confidence and quality that is evident in the intensity and the depth displayed here. Additional layering and complexity is provided by lingering tones of spice, tobacco, moist earth and white truffle. This beautifully-crafted Barolo delivers the grace nd inherent age-worthiness of the La Morra township.